Unfortunately, grey hair is an inevitable part of ageing. However, ‘grey’ isn’t actually a hair pigment in itself – it’s a colour caused by a combination of normally pigmented hairs interspersed with white ones. Your hair colour turns from the appearance of ‘grey’ to completely white when all hair pigment cells stop being produced. It’s thought dark-haired people turn grey earlier than others, but this is just because greying is more obvious. If you are fair-haired or blonde, you probably won’t notice grey hair until you have quite a few white ones, as white hairs blend in easily with your natural colour. By the age of 30 most people have a few ‘grey hairs’, and by 50 at least half of your hair will have turned grey. 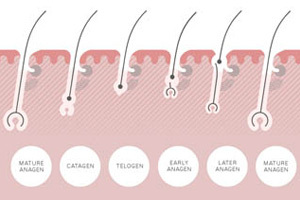 The cells that produce hair colour are formed at the bottom of the hair follicle, and the exact mechanism that causes the pigments to change is still not fully understood. However, genetics play a huge factor in terms of when you will turn grey – if either of your parents turned grey early, it’s probable that you will too. Nutritional and hormonal factors can also affect hair colour, as can illness and stress. One of the reasons for this is because stress, illness and an improper diet can deplete your body of Vitamin B, and various studies have shown that a lack of vitamin B can turn hair white prematurely. Other studies show that certain B vitamins, when taken in large doses, start to reverse the greying process within 3 months and that the hair goes back to being white when the vitamins are stopped. Contrary to popular belief, grey hair is not coarser – it is usually finer, as everyone’s hair gets finer with age. The reason why grey hair seems coarser is because oil glands produce less sebum when you’re older, which results in drier and more roughly-textured hair. This can also be due to the fact that most people chemically process and colour their hair more as they get older. 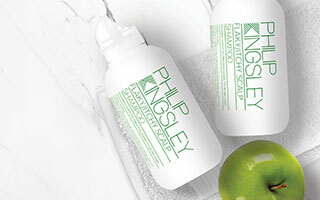 Philip Kingsley Trichologist, Glenn Lyons says "The hair tends to become finer as we age, so more styling aids are used to create body and volume. These can further dry out the hair if used incorrectly. However, reversing this damage can be achieved by using scalp and hair masks. They should be used on a weekly basis to start with and then twice a month. We advise our clients to knead the scalp for 30 seconds before shampooing, and then apply the mask, massaging it in for 5 minutes. It’s also advantageous to use a protective styling aid when blow-drying. Your hair may also ‘feel’ coarser if you pull out your first few grey hairs. This is because constant pulling-out of hair can distort your follicles, resulting in more crinkly hair." Grey hair is often finer and drier, so you might want to change your hair products. A volumizing shampoo and more moisturizing conditioner can be very effective. Grey hair should be handled the same way as naturally pigmented hair. If you want to perm it, do so. But just be aware that perms can cause discolouration and turn grey hair slightly yellow, as can smoking. If discolouration occurs, use a blue/purple-coloured shampoo, conditioner or rinse to camouflage it. Dirt shows up faster on greying hair than any other hair colour. Shampoo and condition daily to get the best out of your hair. Grey hair is more vulnerable to sun damage because it lacks melanin – a pigment that protects your hair and skin from the sun, this is also the reason why fair-skinned people burn more easily. If you have grey hair, it’s very important to use a hair product containing SPF on a daily basis, and if you’re sitting in the sun for a prolonged period of time, use a Swimcap cream for extra protection. 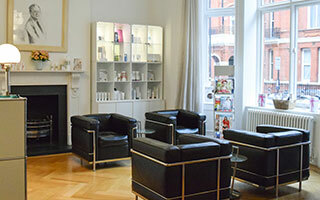 If you would like to find out more about caring for grey hair our clinics based in London and New York specialise in hair and scalp treatments.